In case you missed it, here is a link to BBC2 Iplayer for the short film by Gordon Buchanan called Mull - Eagle Paradise - enjoy! We've made you wait for this moment but they're here at last! 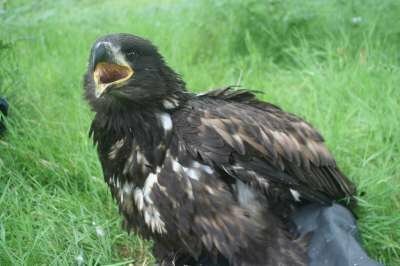 At the end of June this year with help from our friends at Scottish Natural Heritage and Forestry Commission Scotland, we fitted light-weight satellite tags to two of Mull's fine young white-tailed eagle chicks. World renowned bird of prey expert Roy Dennis from the Highland Foundation for Wildlife and climbers Justin Grant, John Taylor, Philippa Revill and Nick Purdy all helped the operation go smoothly with minimal, short-lived disturbance to the chicks and their parents. This is Year 3 of a three year study into the dispersal patterns of immature sea eagles from their nest site. Our first two chicks Mara and Breagha in 2008 from Loch Frisa are still with us, exploring Scotland as they prepare to enter their third winter. The two chicks from 2009, Oran and Venus, sadly are no longer transmitting and we fear we may not be hearing from them again. Gone but not forgotten. Shelly is a female chick and was hatched from the same nest as Oran last year. The nest is on land owned and managed by Forestry Commission Scotland who take great care to ensure the sea eagles nest successfully. The parent birds of Shelly and Oran are now very experienced. The female known by her wing tag as 'Green T' was hatched in the wild on the Isle of Skye in 1998 and her mate is 'Blue 9' from the 1997 releases of Norwegian birds in Wester Ross. This year they hatched two chicks and for a while Shelly had a baby brother. The dramatic story behind him will be told in a future blog but for now the spotlight is on Shelly. Her name is short for the Gaelic word for the summer-blooming yellow flag iris which abound in her nesting glen. She adapted quickly to the satellite tag which weighs just 70 grams and is solar-powered. She fledged on schedule aged 12 weeks old and has since been exploring her natal area. Soon she will be venturing further afield and we'll be with her. Follow her on the tracking page and see other photos of her and all the other pioneering satellite tagged chicks. Good luck Shelly! Midge is a male chick and is a brother to last year's chick Venus who is, sadly 'missing in action'. We're very grateful to the Mull estate owners on whose land Midge was hatched for letting these chicks be part of this important scientific study. Midge's parents have never had wing tags to our knowledge so we don't really know who they are but like the others, they are now very experienced parents and regularly raise a chick each year. Their nest site was particularly poignant this year as it was in the exact same spot as the first ever successful nesting attempt for this reintroduced population of sea eagles 25 years ago in 1985. It was like being transported back in time watching Midge bouncing about on his nest and seeing the adults perched nearby. Happy memories. But back to Midge in 2010! No prizes for guessing how he got his name. We were all being eaten alive by the voracious swarms of the Highland midge one balmy, muggy day in June. They were even beginning to bother Midge himself as he flicked and scratched his head sitting on his nest watching our approach. He too was fitted with his tag with no fuss or hitches and was soon watching us all depart allowing the parents to attend to him and feed him again. Like Shelly, Midge fledged on cue at 12 weeks of age but just take a look at his map when it's updated. You can view our sat tagged chicks here. The news today is that he's already gone as far as the nearby island of Lismore which is quite a big step for a young bird. Perhaps the recent winds have carried him there and he's gone a bit further than he planned? Look out for him if you're sailing past on Calmac's MV Isle of Mull ferry enroute for your autumnal break on Mull! Have a look at Holiday Mull and Iona for ideas. So there you have them. 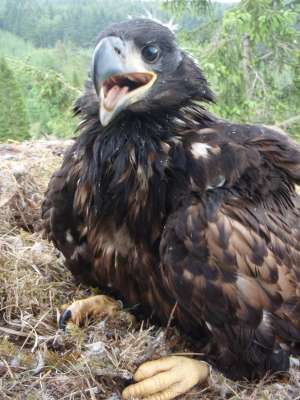 The fabulous, new Mull Eagle Watch chicks beginning to make their way in this dangerous world of ours. Now they're on their own and we can only watch, hope and pray that they live long and successful lives. Good luck Shelly and Midge. I think you're both going to need it. Why not visit the Mull Eagle Watch project this autumn and winter. Debby is standing by to take your call! I can see that Shelly must have flown right over my house at one time!